What exactly does it mean for Chinese food in the US or other Western countries to be "authentic"? This term usually refers to traditional food cultures that are less influenced by Western culture, the sorts of foods that have traditionally been eaten by Chinese people in China. China is a vast country and has numerous different culinary traditions, so there is no single type of "authentic Chinese cuisine", but rather, there are many different regional traditions. Americanized Chinese food, on the other hand, is pretty narrow, encompassing a small set of dishes and ways of preparing them. There are compelling health reasons to prefer the authentic dishes and traditions of preparing them to the more Americanized styles. Read on to find out why. Cantonese food, left, and Szechuan (Sichuan) food, right, are two of the most common regional cuisines available in the U.S.
What is Americanized Chinese food? Americanized Chinese food is its own culinary tradition, which was influenced by, but often bears little resemblance to several traditional Chinese food cultures. Szechuan, Hunan, and Cantonese were the main influences on the Chinese food in America. Sweet sauces - Traditional Chinese food rarely has sweetened sauces for vegetable and meat dishes. Sugar is usually reserved for deserts, like moon cake or buns containing bean paste. American Chinese food frequently makes use of sugar in brown sauces or other thick sauces. Fewer vegetables - Traditional Chinese food makes liberal use of vegetables. Often this takes the form of stir fries with a little bit of meat, and a lot of vegetables. Other times, it takes the form of vegetable-only dishes that are served alongside dishes with meat. Presence of raw vegetables - With the exception of a few lesser-known traditions from the peripheral provinces, such as the far north, most Chinese food rarely has raw vegetables. In many parts of China, people believe that it is unhealthy to eat uncooked vegetables. Use of Western rather than Asian vegetables, i.e. European broccoli, cabbage, or mushrooms instead of Chinese broccoli, cabbage, or mushrooms. Inclusion of cheese or milk products, which are nearly completely absent from most traditional Chinese cuisines. An example would be crab rangoon, a dumpling filled with cream cheese and crab meat. There are also many dishes, like Ma Po Tofu or Kung Pao Chicken, which are common in both authentic and Amercanized traditions. The Americanized versions usually are sweeter. Are you familiar with the distinction between authentic and Americanized Chinese food? Not before reading this page, no. Perhaps vaguely so, but this page is the first time I've seen it expressly talked about. Yes! I was already familiar with this distinction. Most Chinese restaurants in the U.S. serve Americanized Chinese food. Many only serve such food. Even in restaurants with a fully Americanized menu, however, it is common for chefs to be Chinese and know how to cook a wide range of traditional Chinese dishes. It is also common for restaurants to serve both traditional and Americanized food. Some restaurants even have a "Chinese menu", which may be written only in Chinese, or also in English, which which lists more traditional foods. Specials written on a board in Chinese - this is a sign that Chinese people frequent the establishment, and is an almost sure sign that the restaurant is capable of cooking authentic cuisine. Items on the menu that are not part of Americanized Chinese fare - examples would be meats like frog, rabbit, or sea cucumber, or dishes that expressly specify "chinese broccoli" (not "Chinese vegetables" as this is part of Americanized lingo). Other examples include dim sum items like shu mai or steamed buns, sticky rice, or casseroles, dishes including seaweed, watercress, or anything that looks completely unfamiliar and can't be found on the generic take-out menus all across America. Menus with an "Americanized" section - restaurants focusing on authentic or traditional cuisine often relegate Americanized food to a special section of the menu. If you see such a section on the menu, you know you've found an authentic place to dine--and you can conveniently avoid this section of the menu, or order from it consciously, knowing what you're getting. A restaurant that advertises a separate Chinese menu - If you don't see a menu listed, you can ask. Another tip...ask some of your Chinese friends, if you have any. Keep in mind that even if you're at a generic Chinese take-out place, there may be a few more traditional items on the menu. Learn how to locate and identify these items, and you'll be able to enjoy this type of food just about anywhere. Singapore Rice Noodles - This dish, from Hong Kong, involves rice vermicelli stir-fried with vegetables, a mix of seafood and meat, and curry. It's easy to make, and is rarely or never sweetened, so I have found it is a pretty safe bet. Sauteed String Beans (optionally with meat) - The dish is often sweeter in Americanized restaurants, but besides that, it's pretty much the same. It's a simple dish and, while some places cook it better than others, it's also a safer bet. I like ordering it with chicken or pork, or vegetarian. Fried Dumplings - Fried dumplings are, well, fried dumplings. While handmade dumplings are pretty exquisite, I find fried dumplings taste pretty good anywhere I am. The sauce included, which usually consists of soy sauce mixed with dark rice vinegar and scallions, is also usually similar just about anywhere, and is rarely sweetened. Cantonese - Cantonese food comes from Guangdong province in South China. It is sometimes described as "yue" or "yuet" cuisine. Dim Sum, a popular way of serving food, is popular in Cantonese traditions. In Dim Sum, food is brought out in carts and sold item-by-item. Many of the older Chinese restaurants in Chinatowns in American cities are Cantonese in style, because these Chinatowns were originally formed primarily by immigrants from this region of China. Szechuan - Szechuan food comes from Sichuan province, in West-central China. 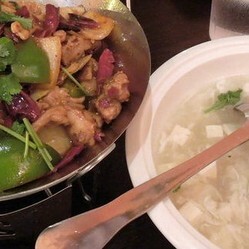 Szechuan food can be spicy, and is characterized by heavy use of hot peppers, ginger, garlic, and szechuan peppercorns. Szechuan peppercorns are not spicy like black pepper, but are intensely aromatic, and also produce a unique sensations on the palate, tingly in small amounts, and temporarily numbing at large levels. Hunan - Hunan food is one of the cuisines that influenced Chinese-American food, but when you try the traditional food it will be very different. Like Sichuan food, it is often spicy, colorful, and aromatic. It uses a wide range of cooking styles, including stir-fries, stews, roasting and braising, and smoked foods. Yunnan - Yunnan food is often among the most alien to Westerners. Yunnan province borders Sichuan, and is remote and mountainous. It can be intensely spicy, and is very diverse. It makes frequent use of mushrooms, using a wide range of different types of mushrooms, and sometimes includes flowers as a food ingredient. Like with other types of Chinese food, noodles and soups are common, as are "hot pot" style dishes. Liaoning - I'm including this because I was lucky enough to discover an authentic Liaoning restaurant in Upper Darby, PA. The food from Liaoning province is one of the few types of Chinese food to include raw vegetables, although only occasionally. It is bold-flavored but not particularly spicy. Dumplings are a key part of Liaoning cuisine, and the dumplings here are very different from the Cantonese-style dumplings served in most Dim Sum restaurants. As it is on the coast, seafood is important in the cuisine of Liaoning. Do you prefer Americanized or Traditional Chinese Food? I don't know. I'm not familiar enough with the distinction to say. Awesome article! Reading through it, I've come to the realization that I've never had authentic Chinese food! We had one place here that used to serve Manderine (not certain of the spelling) and then they closed. Now, we do have some other good places to eat, but they often cross several styles, and even cross into Vietnamese. My favorite is Won Ton soup. Most can handle this, but not all equally well. I had the privilege of working with someone from Malaysia who taught me the difference in Western Chinese food and traditional Chinese cuisine. I must say I prefer the traditional food way better. The other difference is the type of spices they use. Most western Chinese restaurants use MSG, whereas, tradition Chinese food has none whatsoever. Thanks for this, it's really interesting. We have a similar thing in London (for American read "Anglicised"). There are some authentic restaurants about, but some of it is also about how authentic we westerners want our food to be. Never really thought this through, I never really liked most Chinese food, and I see why now - I wan't get the real thing. This is one of my pet peeves. I hate when I go in a restaurant and order something and it's the Americanized version. Thanks John for contributing more info on thees local dishes! I really appreciate it! There are a few dishes in China that have sugar. In Fu JIan Province where I lived for 3 years, and where I frequently return, they have a local favorite dish called Li Zhi Rou. This is little squares of pork and potato that get covered with sweet potato powder and each fried separately. Then these are stir fried with some onions and peppers with a finishing touch of ketchup to get the red color of the sauce, Chinese ketchup is very sweet. Another favorite dish in this province is fried slices of Yu Tou, "Taro", that have honey added at the end of the frying. Liao Ning Province also has an egg plant dish that is served with a very hot melted sugar coating. However, you are correct that most traditional dishes don't have as much sugar as Western dishes. They also tend to never use tomatoes in a sauce like for Italian dishes. Many of the spicy sour dishes will have sugar added as well. Yes! Northern Square, also called Yang Yang Express or Dumpling House. It's on Fairfield Ave. between Garrett Rd and Bywood Ave, easily walkable from the 69th street terminal! You found a liaoning place in upper darby? Don't leave me hanging - which one is it? Why This Way is a consensus-based organization and belief system which may or may not be a religion, depending on your definition of religion.